Below is a list of different teams that you may see when running a rift raid. Use these team builds to generate your own team, selecting units from Part 2 of the raid guide. There are a number of different winning combinations that work, so if you find a team that you think works really well, share your findings in a comment below. One of the most frustrating things about Summoners War is summoning. I had nearly 100 6* units before I pulled Orion, and I unfortunately fed all my Dias to Briand / Fedora when he was provided as a HOH unit. It seems like no matter how much I summon, the units I want are never given to me. You will notice that I’ve tried to give several options below illustrating how you can overcome such shortcomings, however it’s impossible to list them all. As you build out your teams, try to make sure to have a good balance of damage, heals, and support. Tip #1 – If you do not have Lisa or Mihyang which many people consider a great R5 units, then you have several options. One popular option is to use use Delphoi or Fedora as a replacement. Both offer a full cleanse skill with immunity. They both also provide a debuff on their auto attack which makes them very valuable over other cleansers. Tip #2 – Most early game players won’t have Mihyang level 40, yet alone fully skilled. So instead you can use Bella or Chasun on the front line to cover heals. These units work because Bella also has weaken defense debuff, and Chasun provides glancing and attack buff. Tip #3 – You don’t need OP units to be successful in R5. The team above is more of a F2P team that is still pretty popular. You essentially have 3 healers and 2 units that can cleanse. If you are having issues keeping everyone healed, you can replace Delphoi for Bella or Chasun. Having issues keeping your DPS alive? Move him/her to the back line and run a 2 or 3 man front. As you read further in this guide, you will notice that I routinely state how easy people with CR leader have it. Don’t have Hwa? Then you get to use Theo instead. It also gives your team a flex spot since Hwa is one of the Core 4 units. Tip #4 – Having a CR leader provides your team the most flexibility, as your x unit is one of the core monsters. With this team you can run 2 or 3 healers and have Darion on your team that will help keep your team alive as well as keep weaken defense on the boss. Tip #5 – Although Mihyang is a very solid hybrid unit that does damage and heals, you are not required to use her. Bella and Chasun both offer enough utility that both are solid options. Tip #6 – The use of Darion or Dias increases your chances for survival. It is highly recommended you use these units because they also offer key debuffs that help the entire raid team. The introduction of the Fire Panda saved many people the grief of not having a usable leader skill in R5. He’s been such a blessing since he offers so much utility. 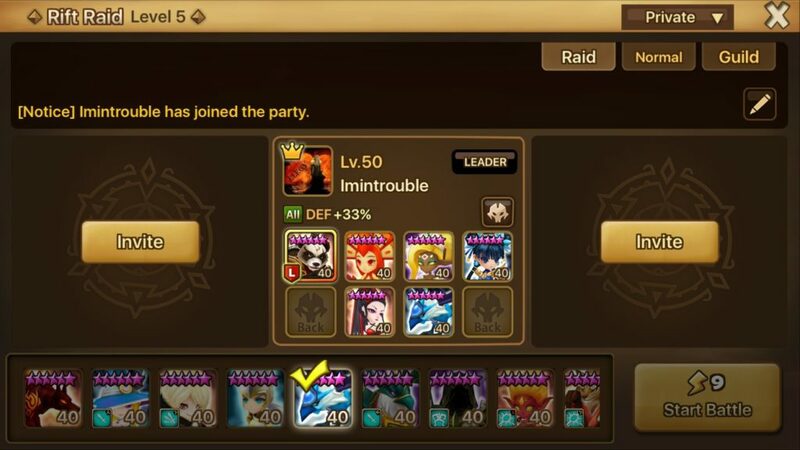 Work on him and don’t regret using devilmon if you don’t have any other Nat 5s worth skilling up. Tip #7 – Many people don’t respect the Fire Panda, but he is a really great unit to have in R5. He offers weaken defense on his first skill and a bunch of other debuffs on his 3rd skill. Tip #8 – You could also run Fedora over Fire Panda if you are lacking heal block. Although he is not shown above, he does a great job keeping your team alive. Back Line: Hwa, Recommended DPS unit or Kona. Tip #9 – Team synergy is the most important. You need to make sure that your team provides all of the necessary debuffs, such as weaken defense and attack, slow, glancing, and heal block. As you use these team builds to create your own team, make sure you have each of these debuffs covered. How about putting teams together without Xiao Lin? I have Lisa and Mihyang both fully skilled, and I often find my team stunned/loaded with debuffs. I sometimes wonder if the people who make these build recommendations actually run the levels they are making recommendations for. It’s working man. Just be sure you fully skilled them up. Lisa and Mihyang also need good speed and ideally violent rune sets. And most of your R5 units should have high resists (90-100 after resist lead bonus). Even then, you’ll sometimes get ruined by debuffs… that’s just how it goes in raids. Can i replace darion with Hwadam?